In a bold effort to improve the Kino system, I began bumping miners. Rebel Dr Robotnik-x attempted to thwart my bumps by yellowboxing me with his Drake. When that failed, he called for the miners to unite into a resistance movement. However, the resistance fell apart when the miners could not be roused from their bot-aspirant slumber. I warped into the next asteroid belt and saw Baxter mining away in his Retriever. It's always a fine thing when I stumble upon the louder rebels. Correctly fearing that bumps were imminent, Baxter retreated to the station. He would not mine again in my presence. Meanwhile, Robotnik came to an epiphany: Was the Father of the New Order merely an alt of Agent Bing Bangboom? The delusion that New Order Agents are merely my alts can be traced back to the early days of the Order. It was a more popular belief back then, since there were fewer Agents. Robotnik suddenly realized that if Bing and James 315 were the same person, perhaps that person was also responsible for the Code. As he peddled his conspiracy theories, Robotnik faced stiff resistance from the New Order loyalists in local. Robotnik's embarrassing past came back to haunt him. 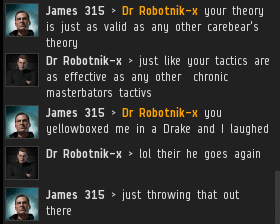 Though his Drake had been docked for several minutes, he couldn't escape the stain it had left on his career as a rebel leader. Still dizzy from being bumped, William Ijonen engaged me in conversation about potential expansion themes. 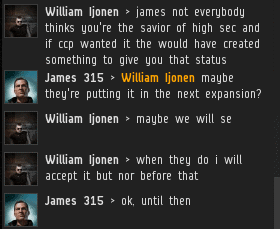 CCP's running low on ideas, so why not? More people come to EVE for the New Order than for ship rebalancing. Robotnik renewed his complaints about Bing. 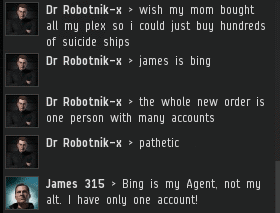 But did he really think he was talking to Bing's alt? I questioned the rebel miners: Could they criticize the war records of the Knights of the Order, when they themselves had never served highsec? After some hesitation, Robotnik decided to go all-in on his conspiracy theory: Every single Agent of the New Order, and presumably every Code-compliant miner who pledges loyalty to the Order, are alts of one man. One man with hundreds, perhaps thousands, of accounts! Grasping for any explanation for the Order's rise--other than the powerful appeal of the Code--the rebel miners gravitated toward denialism. I tried to reason with them. In truth, I do not pay for hundreds, or even dozens of subscriptions. I have only one account. The Agents of the Order are not my alts, nor are the shareholders and countless other supporters of our cause. In a comment to Part 3 of this series, Robotnik confirmed his belief in the alt theory. It may be stunning to see this level of insanity take hold among the miners in highsec, but consider the perspective of the bot-aspirant: They're used to seeing armies of multi-boxing miners. They're not used to seeing real people work together. 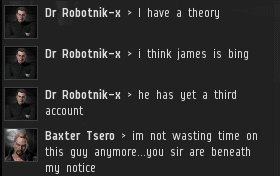 Would Kino be lost forever to the madness of denialism, or could the Saviour of Highsec open their eyes? People should learn to work together, it was teamwork that made EVE famous after all. Teamwork is what EVE is based on even now. And Robotnik is now famous, at least on this site. Do you think he will work with NO? I will admit it seems unlikely, but that is my slightly pessimistic opinion. 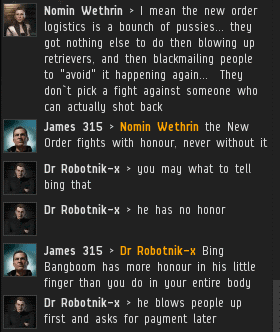 If only Robotnix would bite the bullet and apply to join a null sec corp with an industrial wing - they do exist, and most offer pvp protection and opportunities. If only he could see what all of New Eden could offer instead of being blinded by the 'safety' of Empire space. Such a shame. 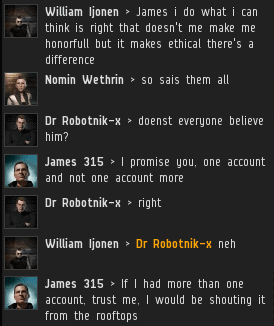 If he tells you he has null sec alts don't believe him - anyone would be laughed out of voice comms for admitting to be mining in empire instead of asking for help mining in an upgraded ore site in null. 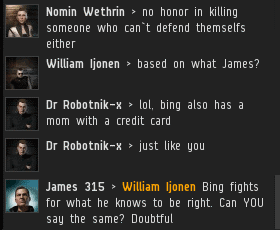 "If he tells you he has null sec alts don't believe him - anyone would be laughed out of voice comms for admitting to be mining in empire instead of asking for help mining in an upgraded ore site in null." Keep on thinking that in your delusions since I know personally of many null personalities who do the HS alt mining thing. Just saying. 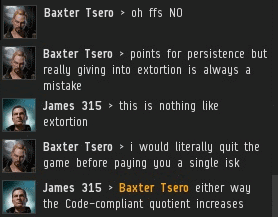 Well, personally, I haven't seen any sov-holding nullsec alliances who mine in highsec. Guess TEST needs an income though. I have yet to hear someone from a nullsec alliance/coalition admit to highsec mining in asteroid belts. So, who do you know and what Corp/alliance are they from? See lost legion articles for an example. I like that high sec miners all think that because they claim to be from null that should make people more wary of them. 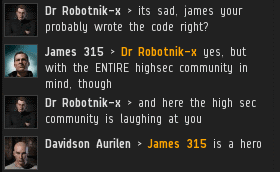 In fact null pilots are more likely to come to high sec to kill miners themselves than to stop others doing it. "either way the code-compliant quotient increases" - ZING! Actually by Robotnik-x's own logic, since he is now famous on this site and regularly written about, he must also be an alt of James 315. There must be no real Robotnik-x and Robotnik-x is also Bing. And by the way this is a side from Scientology!!!!!!!!!!!!!!!!!!!!!!!!!!!!!!!!!!!!!!!!!!!!!!!!!!!!!!!!!!!!!!!!!!!!!!!!!!!!!!!!!!!!!!!!!!!!!!!!!!!!!!!!!!!!!!!!!!!!!!!!!!!!!!!!!!!!!!!!!!!!!!!!!!!!!!!!!!!!!!!!!!!!!!!!!!!!!!!!!!!!!!!!!!!!!!!!!!!!!!!!!!!!!!!!!!!!!!!!!!!!!!!!!!!!!!!!!!!!!!!!!!!!!!!!!!!!!!!!!!!!!!!!!!!!!!! Well I'm pretty amused to see that James sanity is as low as ever. Makes a good laugh!